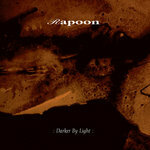 "Darker by Light" is another chapter of the reissue series of Rapoon by Zoharum and chronologically situated between "The Kirghiz Light" and "The Fires of the Borderlands", so it's based around the same framework: static ambient music upon processed ethnic rhythms. The overall result is once again hypnotic and full of small sonic detail behind the curtain of stasis. The first track, "Night that Thunders", is a soundscape based on drones and full of resonances upon a repetitive, but hypnotic, beat. "Lies and Propaganda" is instead based on loops and a more varying rhythmic part. "Tidal Transmissions" is a proper ambient track based on loop and samples and constantly moving by small sonic variation. "Sunday's Shadows" is so slowly moving by accumulation to appear static even if it's properly a crescendo. "From Sleep Awake" marks the return of an ethnic drum, even if processed, with loops which ebb and flow. "Twilight" is the most static, but full of nuances in lower end of the spectrum, track of this album and "Winter's Edge" is the track of the dryer, but religious, atmosphere. "Prayer" features flutes to give high frequencies to a track based on bass ones. "Flight" closes this release with wide spectrum drones which surround the listener. This music reveals the reason why the influence of Rapoon on an entire musical scene is so evident: few artist are so able to properly balance movement and stasis to hypnotize the listener without bore him. A piece of history.